The man's feet sank into the sand leaving a formless footprint, as if it had been made by an animal's hoof. They climbed onto the stones, digging in when they felt the steep rise, and then they walked upward, looking for the horizon. "Flat feet," said the man following him. "And one toe missing. He's missing the big toe on his left foot. There aren't many people like that around here. So it'll be easy." The path went up, among weeds, full of thorns and ground scrub. It was so narrow it looked like an ant's path. It went up to the sky, without switchbacks. It would get lost further along and then reappear later, under a still more distant sky. The feet continued along the path, never leaving it. The man walked with his weight on the calluses of his heels, scraping the rocks with his toenails, scratching his arms, stopping at each horizon to take the measure of his objective: "Not mine, but his," he said. And he turned his head to see who had spoken. Not a speck of wind, only the echo of the sounds he made among the broken branches. Weary of feeling his way along, calculating his steps, holding even his breath: "I'm headed for what I'm headed for," he said again. And he realized it was he who was talking. "He climbed up here, raking the mountain," said the man pursuing him. "He cut the branches with a machete. It was clear that the nerves were pulling him along. And nerves always leave their mark. That's what will do him in." 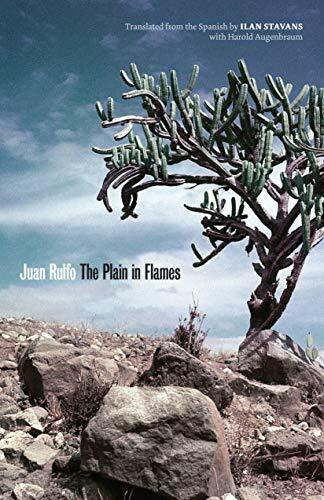 From Juan Rulfo's short novel Pedro Páramo, I proceeded to the same author's pithy and often disturbing short stories, collected as El llano en llamas (The Plain in Flames), available in a new translation. Rarely has a writer done so much with so little, the spareness of the prose matching the barren landscape of poor, rural Mexico that serves as the backdrop of these often haunting tales. The shift of narrative voice in this story, between the perspective of a fugitive and that of the man bent on revenge pursuing him, is made even more kaleidoscopic at the midpoint of this story. For those interested, the photograph on the cover of this edition is one taken by the author himself, one of several side interests he maintained for much of his life. The Seine for the People!